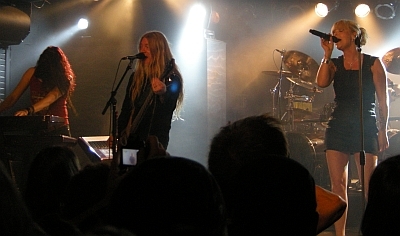 Yes, it’s yet another review of a Nightwish concert, but who can get enough of them, right? This is my second time seeing the band, and both times have been with Anette (still on the everlasting Dark Passion Play tour). Nonetheless, as tired as she and the band may be of touring by now, they still give great concerts and great attention to their fans. 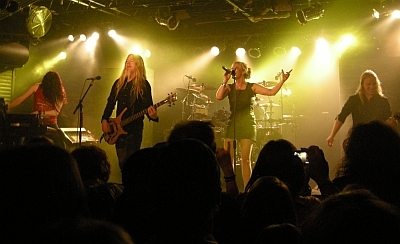 This is the fourth time Nightwish has come to the US on this tour (out of the five or six times total, I think). The response from American audiences has been overwhelming, with people travelling hours to come see the band wherever they may be playing. I may have travelled only an hour or so from my humble little town on the outskirts of Philly, but I met one college student who came down all the way from Rochester, NY, to see Nightwish play their last gig in this area for at least two years (or so sources say). I was lucky enough to meet a few fans as dedicated to Nightwish as I am, who had also gone to the concert in Philadelphia back in August of ’08. The lucky fans got to take a picture with Marco, of which I was extremely jealous that I missed the opportunity to do so too. Those two and the kid from Rochester and I stood together near the right side of the venue. After a lengthy conversation about all our favorite bands, how Within Temptation needs to come to the US again, and after watching clips of Jackass that had been showing on the screen while we were waiting, the show began. The opening band was a Danish act by the name of Volbeat. Despite the lead singer being sick, the band persisted in playing for about forty five minutes. Props to him, though, who managed to make fun of Amy Winehouse, Cannibal Corpse, and Bono within a span of ten minutes. And, it being the band’s first time in the US, they were pretty happy to play for us. Not bad, but Sonata Arctica was better. I don’t really understand why they’d put two bands so different on the same bill. Oh well, they did what they were supposed to do. The crowd was warmed up. After about half an hour (and many chants of "Nightwish! Nightwish!") came the headlining band. It was a surprise to see Mr. 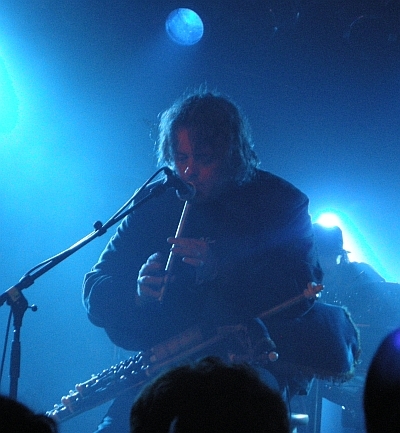 Troy Donockley, who came out onto the stage first and began playing the new intro, Finlandia. 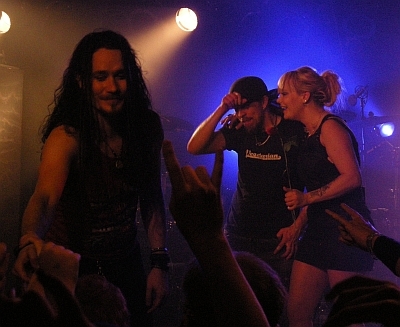 Soon joined by Tuomas, Emppu, and Marco, they finished the intro and went onto playing "7 Days to the Wolves" as Anette came onto the stage. Anette sang her heart out that night, and all the main fan favorites were played. They played some old Tarja-era songs that haven’t been heard sung by Anette until after their three month break ("Romanticide" and "Dead Boy’s Poem") along with the usual fan favorites ("Amaranth", "Nemo", etc.). Marco managed to introduce "Romanticide" with a mother’s day joke which got the crowd laughing. How pleasant to see that the band members still have a sense of humor after two years of heavy touring. It’s been about six months since Anette’s infamous breakdown in Sao Paulo, back in November. There’s a noticeable change in the way she sings the final part of "The Poet and the Pendulum", with a hint of anger and seemingly holding back tears. She put a lot more emotion into it than she did before the Sao Paulo incident and at the end, she stood there with her back turned to the crowd. Hiding tears maybe? Well, she won my sympathies, and I’m pretty sure the rest of the crowd felt the same way. She recovered quickly for "Nemo" though, and the crowd was singing their hearts out. You could barely hear Anette over the fans. Hell, I could barely hear my own voice. A resurrection of the "HEP! HEP!" army was seen at this show as we all simultaneously followed Anette’s chants during songs like "Amaranth", "Nemo", and "Sahara". There seemed to be some sort of technical difficulties backstage, as the sound/stage crew guys kept coming on stage and fixing something. It seemed to have cut the program short because, from what I saw on youtube, the first two shows in the US on this leg of the tour included "Ghost Love Score" and "Escapist". Unfortunately these were not played, and the setlist seemed significantly shorter than the ones I saw online for other shows. Nonetheless, the concert was great and the crowd was wild. Chants of "We love you Anette!" were heard from many in the crowd (including me). It must be great to play at a small venue like that, where you can more or less see every face in the crowd and connect with every one of them. Of course, since the band had Mr. Donockley with them, they used him in not only the intro, but "The Islander" and "Last of the Wilds" too. Oddly enough, Anette didn’t sing during "The Islander" (and obviously not during "Last of the Wilds") and had disappeared off stage for the duration of the two songs. I guess she decided to take it easy on this tour. Anette’s rendition of "Dark Chest of Wonders" has always been a hit, and that was the second to last song they played. One of the liveliest songs in the Nightwish repertoire, everyone in the building was waving their hands in the air (mostly with the "Rock on" gesture) and headbanging while the band ran around the stage enjoying themselves. After leaving the stage for a short bit, the band came back with their only encore, "Wish I Had an Angel", to which everyone reacted as enthusiastically as the last number. Unfortunately, the band had to leave after that song, and no matter how long we chanted "Nightwish! Nightwish!" for, they wouldn’t come back. It was already 11:30 anyway, so people slowly began to leave. I don’t think many people wanted it to end, but all seemed happy and cheerful nonetheless. As I left from the last Nightwish concert in this area for probably the next two years, my new friends and I bid each other farewell and promised to go next time the band came around, whether it be Allentown or back in Philly. Hopefully we’ll see either them or some other great band here soon (fingers crossed for Epica to promote their new album here in the fall! ).